**Please note: This DVD is PAL format and will play on computer DVD players only. Raising & Training the Friesian by stallion-show clinician Lammert Haanstra. 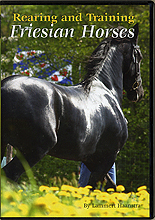 This 2-dvd set takes you through the life of the Friesian, with English voiceover, all filmed at famous Dutch locations, and actually following a Friesian stud colt from conception through maturity. It is a beautiful movie that covers all topics from breeding to foaling, raising the foal, keuring time, training, showing, and more. Lammert Haanstraâ€™s first contact with horses was almost forty years ago as his sister was dating Peter Rinkes, who owned several horses. Having met Peter Rinkes who proved to be a real â€˜horsemanâ€™, Lammert got to know many contacts in the horseworld. He took riding lessons and he met David Buurma who asked him to groom his horses and to assist his wife and help their children as they entered equine competition. Being completely immersed in horses all day as a 20 year old, without a worry in the world and having food and boarding, he quickly learned the trade. He even entered competition himself. Later on he took the instructors course at the Hippische Federatie (National Board for Equine Education). He trained several local riding groups (de Tjongerruiters, de IVO-ruiters en de Waterpoorters) and became very successful in various meetings on local and regional level (for example Friesian championship with 8 horse group Tjongerruiters, taking the second and third place with the other groups and even the highest score at the Levade) . His ability to train horses and riders as well was noted in due time and in his last year as instructor candidate, Mr Ruiterkamp asked Lammert to become instructor at the Hippische Federatie. This was a once in a lifetime opportunity to be employed in the profession he liked most. As life went on he met challenge after challenge and as Lammert discovered he liked teaching very much it proved to be a gift as well. After having been an Instructor at the Hippische Federatie (National Board for Equine Education) for 18 years he was asked to take charge of the daily affairs at the new FPC Friese Paarden Centrum at Drachten. So the Haanstra family moved to Friesland resulting in a series of successful achievements. However there were certain elements in his job, making it hard to achieve the top results he had set as a goal for himself. So eventually Lammert Haanstra and FPC each went their own direction and in 1999 Lammert and Jet decided to start a complete new life having their own business: Lammert was going to teach riding and driving, giving clinics and courses in lounging and Jet would be responsible for the organisation and the business end of their enterprise. Now, six years after that date, Lammert is busier than ever teaching and giving clinics all over the country and even abroad. His DVDâ€™s and the book on lounging (Longeren met Lammert Haanstra with for example pictures of Franke Sloothaak training) are real bestsellers.